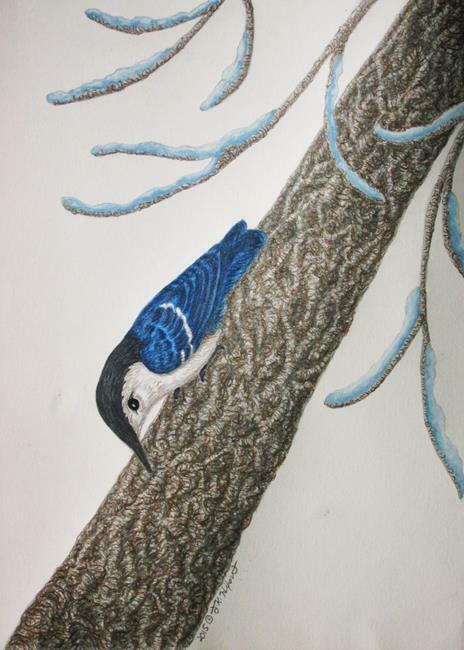 The white-breasted nuthatch is a common sight on trees in North American winters & this picture was inspired by watching one on a tree outside my window. It was done on Bristol board as my first project using Derwent Graphitint pencils, which are like regular pencils only with a touch of subtle color. The muted winter tones were perfect for seeing what the pencils were capable of. The bark was especially fun to do. Winn er of First Place ribbon in the Westlake-Westshore Arts Council Juried Show in 2015.